Regularly reviewing so many Linux operating systems for Linux Picks and Pans has a serious consequence for my computing sanity. Normally, I have a flirtatious episode with a new release each week. I’m always on the lookout for something new and shiny. On the other hand, I fervently dislike dealing with the sheer number of distros that try to reinvent the OS marketplace and fall flat in the process. Let’s face reality here. Open source Linux software offers so many options and design characteristics — Debian, Gentoo, Slackware, Arch, and desktop environments galore, ad nauseum — that it can be boring and repetitive. Many base their decision on usability, performance and the hassle factor — you know, the glitches and anomalies that make a particular distro frustrating or overly bothersome to install and maintain. The challenge is finding a distro that lets you compute without getting in the way. 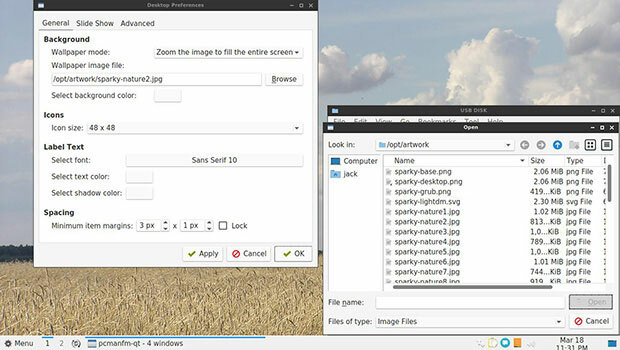 Enter SparkyLinux, an alternative to the myriad of options and trial runs into the world of Linux. In general, SparkyLinux does not target Linux beginners, although new users will find it easy to use and hassle-free. 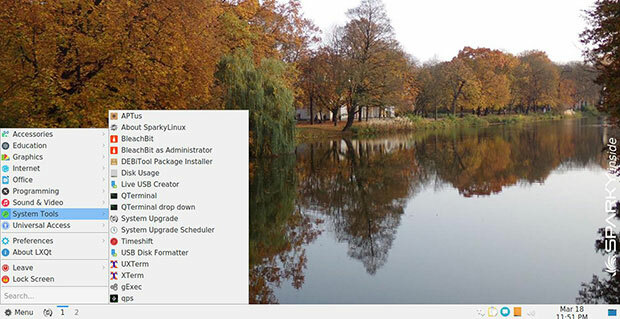 This distro is an ideal choice for those in the middle — neither Linux newbies nor yet Linux pros. A few weeks ago, I grabbed the latest edition of the Rolling release of version 5.7 posted on March 6. The series 5 version, the Nibiru releases, began rolling out last July. It is a new snapshot of the project’s Rolling branch, which is based on Debian Testing. 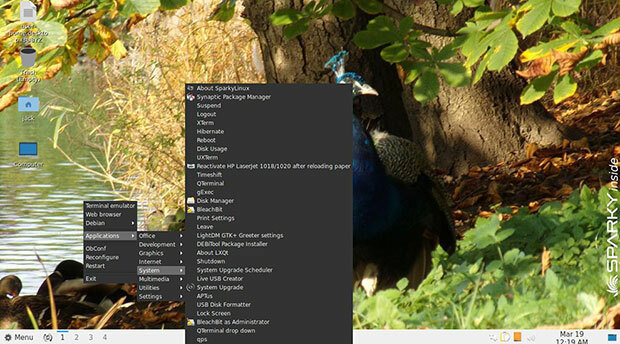 This is the first of this year’s ISO images of the Rolling line, which is based on Debian Testing “Buster.” It is a full-featured OS that works out of the box and contains a selection of preinstalled common use software applications for home users. Why the glee over rolling releases? This upgrade method pushes the latest packages and edition upgrades as they are ready, without requiring a complete reinstallation. This approach is a big convenience, especially if you’re running SparkyLinux from the USB drive. Puppy Linux. Although Puppy Linux and other offshoot distros still exist, I was drawn to the rolling release potential on a USB drive installation. Being able to pop a USB stick into any computer I use remains part of my work routine. It is a workable solution and better alternative to carrying around my own hardware when my location deadheads to a room filled with other people’s gear. SparkyLinux Nibiru’s rolling update capability adds to the convenience by eliminating the need to create updated versions of the portable OS periodically. Installing Linux distros to a USB drive can have its drawbacks. No matter what changes I made to the configuration — add/remove software, change desktop backgrounds, alter system preferences, or save files to the USB drive — those changes were retained on the USB drive on subsequent reboots. Even better, regardless of whatever computer I booted that SparkyLinux USB drive from, SparkyLinux appeared on the screen exactly the way it appeared in my last session on a different computer. That was a pleasant surprise. SparkyLinux performed with the USB installation far better than any other portable Linux-on-a-stick distros I’ve used over the years. SparkyLinux’s USB installation worked so well, I used it on multiple computers for weeks without missing a beat. I had to install only two applications essential to my workflow: GIMP image editor and Geany IDE Editor. Both up and running from the USB drive to RAM did not impair the OS’ performance. This is is a collection of small scripts to manage the system’s packages. It is basically a front end that automates the process of downloading and installing system packages. Installing SparkyLinux to the 8GB USB stick took nearly 45 minutes. The suggested time frame is 15-30 minutes. The process was straightforward. Ample videos and Wiki documentation are available on the developer’s website to walk you through the installation. For what it is worth, the online documentation about how to install SparkyLinux to a USB drive may be a bit outdated for this latest release. Even though the directions tell you to create three partitions on the USB drive — one for the OS, one for the home directory, and one for the swap space — I deliberately did not do that.